ISLAMABAD, (DNA) – The Supreme Court (SC) on Tuesday started hearing a plea filed by ousted prime minister Nawaz Sharif seeking bail on medical grounds.The former premier was convicted by an accountability court in the Al Azizia / Hill Metal corruption reference filed by the National Accountability Bureau (NAB) in light of the top court’s Panamagate judgment. He was acquitted in Flagship reference.The Pakistan Muslim League-Nawaz (PML-N) supremo challenged the IHC verdict in the apex court. The appeal is being heard by a three-member bench headed by Chief Justice Asif Saeed Khosa. Defence counsel Khawaja Haris is presenting arguments in the case and citing medical reports. He claimed that the three-time premier is taking 17 different medications. “We know that Nawaz receives medical care in London. We want to know whether his health deteriorated in prison,” asked the chief justice during the hearing of the petition. In order to deliberate whether the apex court could intervene or not, Justice Khosa directed Khawaja Haris to read reports from imprisonment date. Initially, Nawaz was moved to Adiala Jail. Upon request, he was shifted to Kot Lakhpat jail in Punjab’s capital to serve out the seven-year imprisonment sentence. 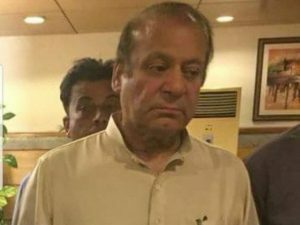 Nawaz’s legal team filed a general writ petition for suspension of the sentence in the Islamabad High Court (IHC). This was followed by an appeal challenging the verdict and another seeking suspension of the sentence on medical grounds. In February, the high court rejected Nawaz’s plea seeking suspension of sentence in Al Azizia verdict on medical grounds.